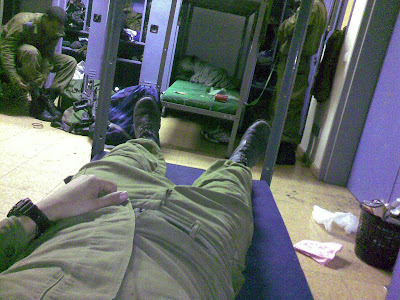 Sleeping in your uniform and boots... ah, the joy of the army and middle of the night guard duty. It seems you hear a lot about night guard duty what does that entail exactly. Do you just sit outside and watch the fence or what. Hey, for the record: I just stumbled on your blog by way of NMF#7 (Israel Chronicles) and read the last 30? 40? bunch of posts. I find everything you're writing really fascinating; thanks so much for the inside look at your life, and everything you are up to! The chocolate wafer bar pushup incident, the fact that you dated Ms. South Carolina, and the fact that the guy from Virginia knows how to shoot while most good Jewish boys don't was utterly hilarious. Thanks! Oops- forgot to tell you that I linked to you before! I Love your blog, and thanks for wonderful reading! anonymous 1 - you pretty much nailed it! Just watch the fence, unfortunately you're not allowed to sit though. Chana, thanks for your comment. Keep reading. Nmf - thanks for the link. Feel free to post my stuff or anything, as long as you link! Well, thanks for the confirmation keep on posting. Tired soldier have a sweet dream.